During our talk with +Ryan Estrada on the Lean Into Art Cast (http://leanintoart.com/blog/2013/1/19/lia-cast-68-doing-it-wrong-with-ryan-estrada.html), we discussed a bit of the pain involved in getting PDF comics at reasonable prices and in convenient formats for our tablets. So I decided to start putting these thoughts into practice. Sure, you can read it here on G+ for free (gallery attached to this post), and you can even opt to buy the print edition on IndyPlanet (http://indyplanet.com/store/product_info.php?products_id=2993). But neither of those solve the problem for those who wish to read comics on their tablet. So check out the entire book in the gallery and if you decide that you'd like to read it on your tablet, just go to http://gum.co/izeP and pay whatever you think it's worth! My 197-page Graphic Novel, here on Google+ for free. 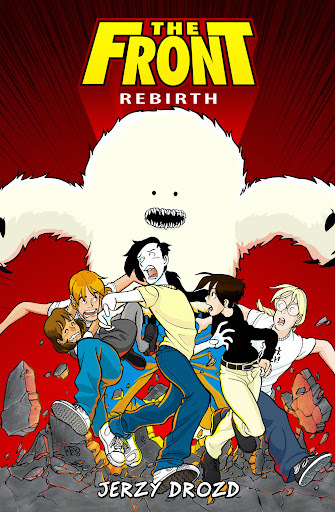 Sure, you could pay to get The Front: Rebirth as a PDF for your tablet (http://www.indyplanet.com/digital/product_info.php?products_id=2993) or a print copy (http://indyplanet.com/store/product_info.php?products_id=2993). But why go through all that trouble when you can read the entire book here on G+ for free? I shared this a while back, but following +Mike Elgan's example, I figured it might be a good idea to occasionally re-share albums for folks who recently gave me a follow. +Ryan Estrada is also my inspiration for considering the same move—with about a dozen of my out of print books. Print on demand isn't worth it. Ebooks are spiraling below a cup of coffee, price-wise It's all about "if it doesn't spread, it's dead" and then we creators are ready to make money on our super fans. Wish I had some super fans. Works better in comics and genre fiction than nonfiction and serious games, I think. But, meanwhile, I'm sitting on a mountain of IP/content that's, well, just sitting there. I use an app called ComiXology. Its pretty decent for tablets (I have a Nexus 7), I'll check out the novel though, PDF reading can be sketchy period, regardless of the format or medium.